A school girl who attends a school called the Pokémon Technical Institute which is located somewhere between Cerulean City and Vermilion City. She is a character of the day in The School of Hard Knocks. She also appears in the Electric Tale of Pikachu manga. In The School of Hard Knocks Ash, Misty, and Brock had met a schoolboy named Joe who attended a Pokémon Trainer's School called Pokémon Tech. Apparently, upperclassmen at the school were bullying younger or less experienced students under the guise of "tutoring". The one responsible for this was Giselle, a pretty, popular, and highly experienced student. Later on, Giselle shows up initially to confront and belittle Joe after a recent loss against Misty. During her talk with Joe, it becomes apparent that Giselle is actually a very mean person that particularly cares very little for young, inexperienced trainers. Misty, angry at Giselle and her stuck-up attitude, challenged her to a Pokémon battle. Giselle defeated Misty with a Graveler, versus Starmie, despite the disadvantage of a Rock-type and a Water-type Pokémon. After taunting the young Gym Leader, Giselle then started to lecture her fellow students. Ash got angry himself and argued that Pokémon training was more than types and levels - one needs to be friends with them, too. Giselle laughed haughtily and called Ash a beginner. She teased him about having been on a journey for two months and only having two badges and three Pokémon. She then proceeded to note that Pikachu are an awful choice for first Pokémon, and that they're more fitting as pets for little girls, and begun to say trivia about Pikachu and its evolved form, Raichu. Ash and Pikachu were extremely insulted and angered, and challenged Giselle to a battle. Giselle used a Cubone. Without being able to use Electric-type moves, Ash told Pikachu to fight back in any way it could. Pikachu then began to attack Cubone with a series of random physical attacks - biting, scratching, etc. Eventually Pikachu covered Cubone's eyes with its own skull helmet and Cubone ended up knocking itself out with its own Bonemerang attack. Giselle was shocked by the defeat and admitted that people can't learn through books alone. Team Rocket then tried to raid the school, but Giselle led the charge against them and got all the students to assist in chasing the criminals away. Joe and Giselle reconciled, and Joe left the school to collect badges for the Pokémon League. Giselle makes an appearance in the Electric Tale of Pikachu manga. She is apparently traveling through Kanto and catching high-rank Pokémon. She made two cameo appearances. She's seen with Joe in one of them. * Giselle, to date, is the only female that Ash has found attractive enough to abandon his usual indifference towards romance. Some might argue that some other characters have made him feel this way, but so far Giselle is the only inarguable one. 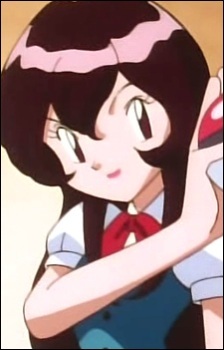 * Giselle was also the only girl younger than Brock that he found attractive during all the series. * A Trainer based on Giselle appears in Pokémon Yellow; a female Junior Trainer with a Cubone is on Route 6, which, like Pokémon Tech in the anime, is between Cerulean City and Vermilion City. She is seen talking to a male Junior Trainer with a Weepinbell. When the player talks to her, she would say I'm training for my love. Don't bother me!. * Giselle is one of the few characters in the anime whose Japanese name isn't spelled using katakana. Instead, it is spelled in kanji.